Okanagan Falls, Okanagan Valley, British Columbia, CanadaEarly 2016 looked a lot like 2015 with warm dry conditions, early budburst and a warm advanced harvest, but cool and wet weather brought all that to a halt in July extending the season back into a more normal and acceptable time frame for pinot noir maturation. Harvest began September 14. The fruit is a mix of McLean Creek Road (Okanagan Falls), Reimer Vineyard (South East Kelowna) and two other East Kelowna sites. At the winery the fruit gets a cold soak in small open top fermenters before an 18-day indigenous ferment with gentle hand plunging. Post maceration, the wine ages ten months in seasoned French oak barrels. Sweet, juicy, gulpable pinot with persistent cinnamon spice and a stream of acidity that holds it all together. A delicious, no need to think about it pinot, that is ready to drink. Oregon meets California. A hefty 2,000 cases made. 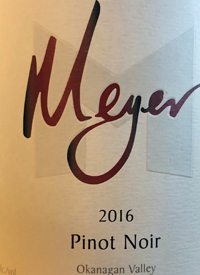 This is the best $26 pinot in the market.Tasted: 07 March 2018Tasted by: Anthony GismondiTreve Ring Prices: BC	25.00	winery direct, vqa, private retail Producer: Meyer Family VineyardsDistributors: International Cellars Inc.
Okanagan Falls, Okanagan Valley, British Columbia, CanadaPouring a downy / cloudy hue, this youthful pinot gains friends with its joyous ease. Ripe raspberry, perfumed plums and roses swirl on a soft, lighty spiced palate, finishing with smoked salts and cinnamon warmth. This is sourced from MFV's home vineyard in Okanagan Falls, as well as three vineyards in East Kelowna. After a long native ferment, the wines was pressed into older French oak barrels for ten months. Riper and softer, but still stencilled with structure, this is a welcoming pinot for drinking now, at a great price.Tasted: 07 March 2018Tasted by: Anthony GismondiTreve Ring Prices: BC	25.00	winery direct, vqa, private retail Producer: Meyer Family VineyardsDistributors: International Cellars Inc.